Attain a defining look by wearing these midnight blue coloured jeans from Mufti. Decked with washed and whiskered pattern, this pair features a zip fly, button closure and the traditional five-pocket design. Further, it has got brand detailing at the back waistline. 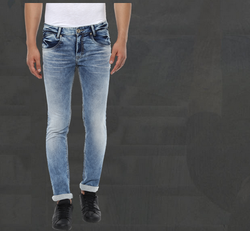 Lending super comfort, these jeans can be paired with a T-shirt and sneakers.